Police are appealing for information after hundreds flocked to an illegal rave in Burgess Hill last night. Officers were called to the town at around 11.30pm to deal with the rave and to turn people away who had arrived in the town. Read our original story here. 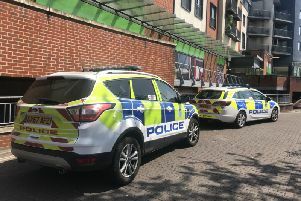 A Sussex Police spokesman said: “Around 200 people were inside a building in Victoria Road and around 300 more began arriving on trains with the intent of attending the rave. “Officers working with their British Transport Police colleagues, were able to identify people travelling to the illegal event and began to turn them away. Detective Sergeant Dave Morton said: “We did request that if anyone was on their way to the town or the rave, that they did not attend. “The temperature was close to freezing last night and many people were turning up outside in the cold conditions. “Although there are powers available to the police to close down illegal gatherings such as this, before exercising these powers an assessment has to be undertaken to determine whether or not such a gathering can be closed down safely and effectively. “The assessment was that it would not be possible or safe to close the event in view of the time of night and the numbers of people arriving in the town to try and attend it. “We continued to monitor the site, where there were around 200 people inside and brought it to a safe conclusion at around 5.30am with minimum disruption to the community. If anyone has any information about the rave, please contact police online or ring 101 quoting Operation Corvette.